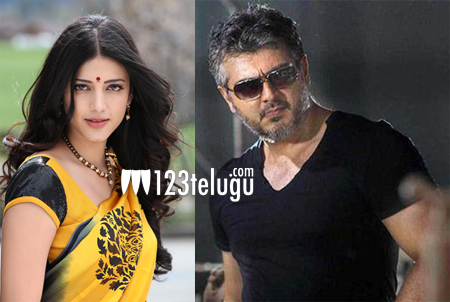 Shruti Haasan to pair up with Ajith? Gorgeous beauty Shruti Haasan is one of the most popular top league actresses down south. The multitalented actress is currently shooting for Mahesh Babu’s film with Koratala Siva, ‘Srimanthudu’ and with Tamil superstar Vijay for the socio-fantasy flick ‘Puli’. According to the latest reports from the Tamil film circles, Shruti may soon pair up with Thala Ajith in his next film. The much discussed Thala Ajith’s 56th film will be directed by Siva of Gopichand’s ‘Souryam’ and Ravi Teja’s ‘Daruvu’ fame. The film is expected to be an action packed entertainer and it will also feature the dusky Telugu beauty Bindu Madhavi in a crucial role. Senior producer AM Ratnam will produce this high budget entertainer and more details regarding the film are expected in an official press release later this week.